In just one word I would describe Christmastime in London as magical. There is something about Christmas in London that is more special and spectacular than anywhere else I’ve been. With so much to see and do during the Christmas season, I’ve put together a guide to London at Christmastime, so that you can make the most of this beautiful time in this beautiful city. December in London is cold (though much more temperate than the Boston winters I am used to) and it is dark. The sun sets before 4 pm for the days around the winter equinox! You’d think it would be a depressing time of year, but the city rallies around the Christmas holiday. For every early sunset, there is a brilliant lights display on a beautiful street to brighten up the holiday season. Here are the top things you need to do in London at Christmas! There are so many places to see the Christmas lights! It feels like everywhere I turn these days, a new lights display is popping up. 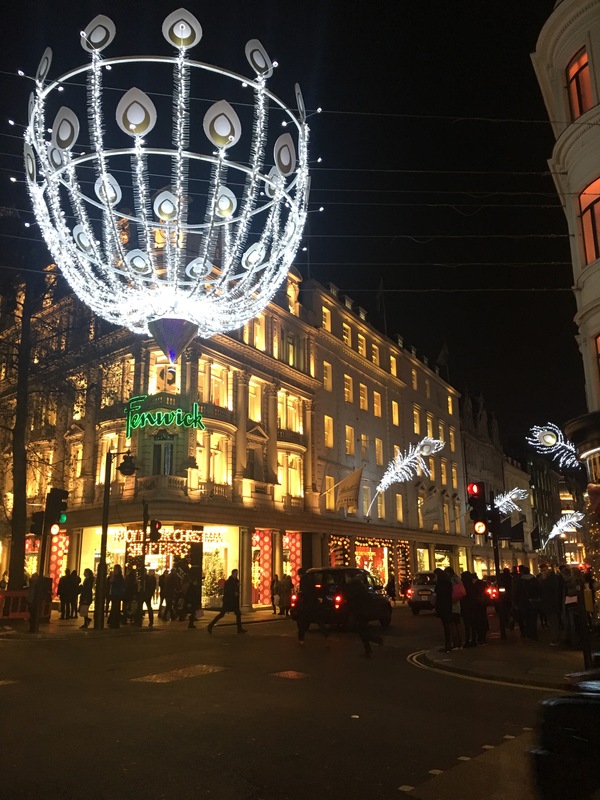 Oxford Street and Regent Street are known for their shopping, and around Christmas, they are known for their lights! Both streets are lit up beautifully for Christmastime, it almost makes you forget the insane crowds that pack the streets to shop and admire the lights. To see the best of London’s lights, start by taking the Tube to Piccadilly Circus (Piccadilly, Victoria lines). From there, walk up Regent Street. Admire the stunning lights and peek at the window displays of all the shops. Take a right onto Beak Street, then turn left onto Carnaby and take in the stunning Carnaby Christmas Carnival! 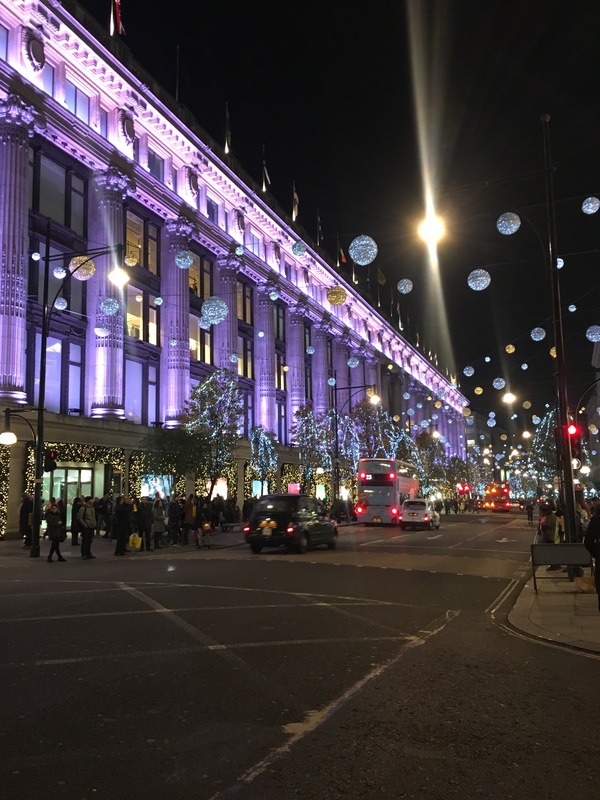 From there, you can pop into Liberty’s for some Christmas shopping on your way to Oxford Circus and Oxford Street. Walking on the right side of the street will take you past all the department stores and their windows. Selfridge’s, in particular, has some neat windows! They also have a big Christmas shop on the top floor. Walking down the left side of the street will allow you to peek down to see the lights in Mayfair. New Bond Street has a beautiful display. Wear comfortable shoes and wander throughout to get the full holiday light experience! Give yourself plenty of time to walk the streets and prepare for crowds. There are A LOT of people on these streets. Be smart about getting the perfect picture. Lots of people will step into the street and traffic to get a good one. Be aware! Dress warmly! It can get pretty darn cold being out for so long, so remember to bring a hat and gloves. Comfortable shoes are also a wise idea. Skip the bus. I found an article about bus routes you can take to see the lights, so we hopped on the 10 last year with high hopes to see the lights from the warm and dry bus! This plan did not work – you can barely see the lights because the lights on the bus are so bright! We went on a rainy day and there was fog on the windows to add to it. Bummer! If you need to pop in somewhere for a warming beverage, I recommend the ridiculous hot chocolate from SAID dal 1923 just off Carnaby Street or a mulled wine at The Clachan in Soho, the Punchbowl or the Audley in Mayfair. Make a whole Christmas spectacular of it by stopping into Liberty London and Selfridges and heading up to their Christmas shops. They each have a wonderful selection of ornaments, crackers and other Christmas knick-knacks, though be warned they can be very crowded. If you are a huge Christmas fan who can handle tons of walking, the above tour will bring you right to the edge of Hyde Park where Winter Wonderland pops up each year. Winter Wonderland is basically a Christmas-themed amusement park built up each Christmas in the northeast corner of Hyde Park. It is over-the-top, it is crowded, but honestly, it’s spectacular. It is so much fun and unique to London, so if you love Christmas you have to check it out. It’s free to enter and there are rides, markets, food stalls, ice skating, shows and even a Bavarian style beer hall, with plenty for people of all ages to enjoy. You have to see it to really understand it and appreciate it. I can’t recommend it enough, it is an experience! Dress warm! The whole thing is outside. It’s better to go on a weekday because this place gets packed on weekends. Expect crowds and lines at any time. Bring cash. Some ticket booths don’t accept cards and you’ll need tickets to ride the rides. If you want to do any of the paid activities, book ahead! Most years these sell out in advance, so be sure to book the ones you’re interested in. It is totally possible to spend time at Winter Wonderland and have fun without spending a cent (pence?). The atmosphere is wonderfully festive. If your budget or diary won’t allow for a weekend away to the famous Christmas markets on the continent, look no further than London! There are many markets popping up all over the city. The easiest ones to mix into a visit to London are those along the south bank. Both the Southbank Centre and London Bridge City have Christmas markets along the Thames. They make sightseeing even more fun! For more markets, check out these Christmas markets and fairs in London in Time Out. What’s better than afternoon tea? A Christmas afternoon tea! Many places around the city get decked out for the Christmas season and tea rooms are no exception. You may even notice some festive additions to the menu! I’m taking my own advice and have two teas booked this month (I love afternoon tea!). I can’t wait and I will update this once I’ve gone! Like many restaurants and stores throughout London, the pubs get into the spirit of the season and decorate for Christmas and offer special Christmas menus. Book a festive meal or grab a pint to take in the cozy ambiance. The Churchill Arms, especially, really goes all in on the Christmas decorations. It is covered in Christmas trees for the month of December! Visit on a warmer night, grab a pint and stand outside to enjoy the decorations of the Churchill Arms at Christmas. How better to celebrate the season than with music? In London, we are truly spoilt for choice when it comes to the arts, and music is no exception. There are so many concerts, both free and ticketed, around London with Christmas music. Christmas Carols are a wonderful English tradition and I cannot recommend the show we saw atRoyal Albert Hall enough! We saw the Glory of Christmas and it was so much fun. The audience really got into the caroling! Last year, we saw Handel’s Messiah by candlelight (and period costume) at the Southbank Centre. It was pretty cool! This year we’ll be heading to see a Christmas concert at the . Another wonderful concert will be the Brompton Oratory Christmas carols. What is your favourite thing to do in London at Christmastime?